Alton Brown, CASA, Cooking with LIzzy, family, Family Dinner day, Food Network, Recipes, Whatever Happened to Dinner? 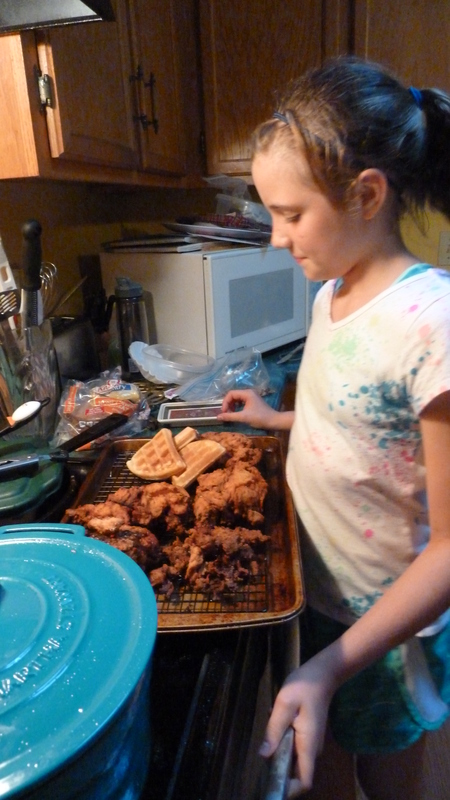 Cooking with Lizzy: How many 12-year-olds cook dinner every night? How many 12-year-old kids do you know who cook dinner for their family almost every night? Most recently, Lizzy brought a scrumptious peach cobbler made from scratch to the church picnic in a cast iron skillet. That impressed me. Her own cast iron skillet. Given to her by her grandmother’s neighbor who apparently has great collections of things. He had a brand new one just sitting around. Lizzy seasoned the cast iron skillet and uses it regularly. She also owns several other kitchen appliances, pans, and food prep equipment. She asks for these things for birthday and Christmas gifts. 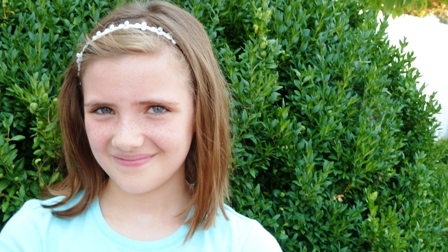 Lizzy is your ordinary (well not really, but we’ll get to that in a minute) 12-year-old bouncy kid with gorgeous hazel eyes and a face that lights up whenever she’s excited, especially talking about or demonstrating cooking. She runs cross country at her middle school and participates in spring musicals, but otherwise after school on most weekdays, you’ll find her stirring, dredging, frying, baking, pulsing in the kitchen of her family’s suburban split level. This she loves, and so does her family, especially her parents. She tries to appease the food likes of her 15-year-old brother, Sam, who plays football in the fall and lives for it the rest of the year. Most everything Lizzy makes is from scratch: even the dressing for the salad. She throws a salad and dressing together, like a chef on the Food Network, as the final touch for her meal. She calls out the dressing ingredients as she adds them to a shaker: olive oil, apple cider vinegar, a little brown sugar, a grinder turn from a pepper mill, and a literal pinch of salt from her salt bowl. 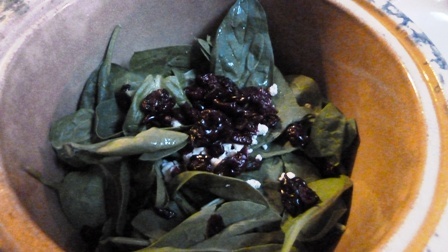 She tosses some spinach leaves in a bowl, adds some blue cheese crumbles and dried cranberries—two of her favorite foods. Presto: salad to round out the evening supper. She is 12 years old. Not 42 or even 22. Children today only make cookies and occasional muffins, boxed cakes or scrambled eggs maybe. Right? Not fried chicken, homemade waffles, and salads plus dressing with such a flourish. Or maybe I’m behind the times. At least that was the case when I grew up, and with my own girls. I always felt I did pretty good “letting” them try their hand in the kitchen. But not take over. Virginia will have to attend the local school board meeting tonight; she’s head of the Harrisonburg Education Association. She’ll leave before Lizzy’s brother and dad get home from football practice, which means they won’t actually get to eat all together, which is often how it is for many families with school-age children. Lizzy keeps things warm in the oven. Her dad teaches AP courses in European history and psychology, and is a defensive football coach at the local high school. Back in the day—say the 1930s and 40s, children were more frequently called on to take over the cooking at an early age, perhaps even on a wood cookstove. I delved into that last fall in several posts reviewing books of Appalachian sociologist Peggy Shifflett. In her book Mom’s Family Pie, Shifflett talks about 8-10 year old girls often taking on cooking responsibilities and definitely by the time they were teens. But who does this in 2015? I did find at least one other 12-year-old cook who reminds me somewhat of Lizzy in her kitchen. Lizzy says she started learning to cook when she was 7 or so, especially making typical cookies and muffins; she loved learning at the side of her grandmother who lives about 50 miles away, who taught her the waffle recipe she’ll be making tonight. Another recipe Lizzy loves came from Alton Brown on Food Network, and won a blue ribbon (first place) for Lizzy last year in the county fair. This year she won 15 ribbons in various craft and cooking categories. 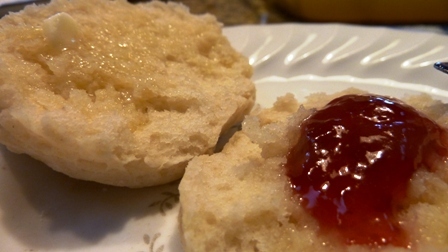 I was delighted to try a new recipe for biscuits, because mine were always crumbly and flat in taste and size. These turned out great: they held together very well and were mouth-watering delicious! 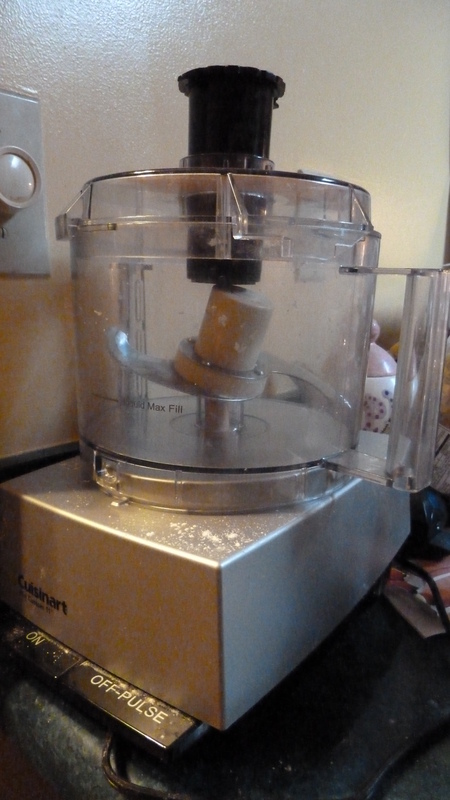 Put all of that in a food processor to mix it (or cut in the butter with a pastry blender and mix that way). Knead together gently a few turns on floured board. 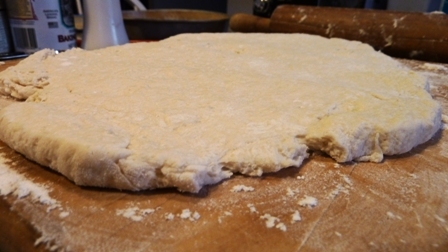 Roll out dough ¼ inch thick. (Alton Brown says 1 inch thick. I’ll try that next time!) Cut out with floured biscuit cutter. 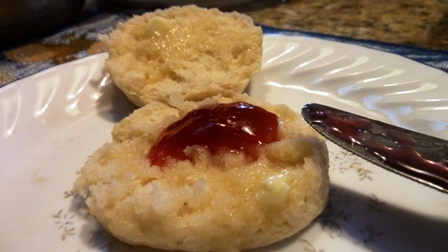 Place biscuits close together with sides touching in a lightly greased pan. Bake at 350 degrees for 10-15 minutes (Alton’s recipe says 400 degrees). Serve while warm. Next time we’ll watch, step-by-step, how to make fried chicken the Lizzy way. When did you or your children start cooking? What favorites did they or you like to make? This series posted with a salute to Family Dinner Day, the last Monday in September (February dates in Canada), originally launched from CASA, which encourages eating together as a family as one way to fight the societal influences that sometimes lead to addictions in youth. This is the theme of my most recent book, Whatever Happened to Dinner: Recipes and Reflections for Family Mealtime. Kudos to Chef Lizzie, maybe soon ready to star as the youngest member of the Food Network. About your prompt. I may have mentioned that grandson Curtis, age 11, helped me make spaghetti sauce and a seasoning for a pork roast when he spend two days with us just before school started. He enjoyed the role of sous chef for both recipes. Yesterday his mother proudly proclaimed that she and Curtis made crock-pot meals for the coming week last weekend, so they would have evening meals ready to go on that first week of school when everyone comes home exhausted. My Grandma Longenecker would say, “Strike when the iron’s hot,” which applies here to capitalizing on children’s emerging interest in food prep. I don’t think Curtis is especially interested in accruing blue ribbons. He has just found another outlet for his creativity. Yes I was very interested in your post about Curtis: sous chef, I like that! Your grandmother’s line definitely does apply here–I think Virginia is so wise to nurture, encourage, and support the creative outlets for both her children (while enjoying and marveling too at the tremendous help it is). Lizzie is a marvel! I don’t remember not helping my mother cook. I was the only daughter so there was a clear division of labor–my five brothers were supposed to help with the farm work. It became an outlet for my own creativity when I was about Lizzie’s age and introduced new things like homemade pizza to the menu. I have always appreciated the ease in the kitchen I picked up so young, even though it often felt like drudgery–frying up skilletfuls of bacon, eggs, and potatoes every morning at 7. I find cooking and baking relaxing also. This was a fascinating story to read about Lizzy and her culinary experiences. Now I do not do much of either but I still can put together a nice meal if I have to. Lizzy sounds very resourceful and happy. I want to read more ! My sister and I had always helped our grandma with the cooking but I know I mentioned 4th grade as when she had us start doing the baking. It was , like a new school year and this was a class we had everyday, just at home. We would have just turned 9 a month earlier. We had ” the division of labor” also, as our 4 brothers did outside work and took care of the animals. 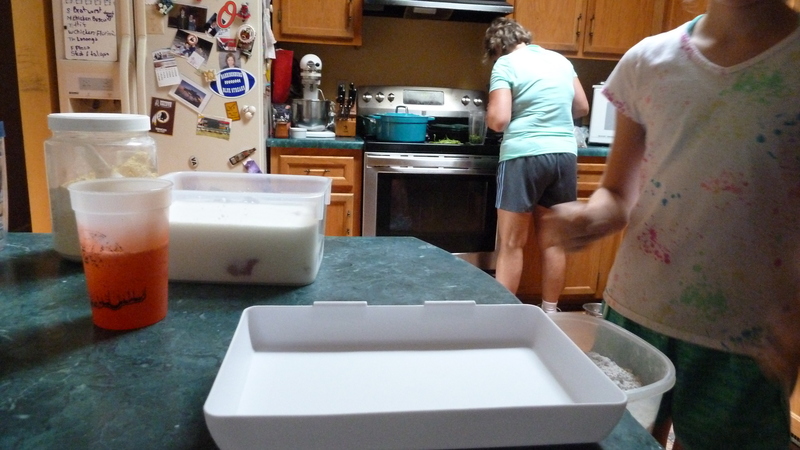 The canning/baking/cooking gene pretty much skipped my mother. But with a live in grandma (her mother) she only helped as needed. Just like she’ll help me now. Her forte is flowers , perennials, flowering anything, greenery inside or out. All her fingers are green, not just a thumb. Oh, I’m a lazy biscuit maker. I just roll into a rectangle and cut into squares with the pizza cutter. One rolling, one cutting and done. That doesn’t sound too lazy to me, Athanasia–at least assuming that you mix up the dough, but I get why making them into squares saves time over rounds with all the holy dough left. How great to have a team like you do–your mother helping with flowers, greenery; when the garden is in full tilt production like it is now, my flower beds just kind of have to take care of themselves, unfortunately. I’m anxious to get back to tackling them. I enjoy the flowers more. 🙂 And I’m taking a new look at my attitude toward cooking–thanks for noting you find baking and cooking relaxing also. Too often I think of it only as “one more thing” that has to be done but certainly as I work on blog posts, try new things, reach beyond the same old–I enjoy the creativity too. This would make a wonderful article for Living Magazine. I bet Laura Purcell could really bring out her personality!! She is a very interesting young person. I recently ate supper with her @ Taste of Thai and did some catching up. Liz has been interested in most things “green” and knows a lot about living life, leaving the smallest carbon footprint on creation. If she weren’t in school, I would invite her to attend the Environmental Conference @ Montreat on Sept. 15 through the 18th. She and I have attended a conference at Montreat on one other occasion. Lizzy is so involved with many aspects of church; as she joined, she wanted to help out with the fellowship committee and was beautifully serving punch this past Sunday at a reception. 🙂 It would make a wonderful piece for Living–I’ve got two more parts coming up with much more! (But I didn’t know about her “green” side. Yet.) Thanks for the comment and endorsement, Ramona! Wow, Beverly, what a great idea–I love the fact you made a photo book out of it. I’m sure Lizzie was up to making fruitcake! I can’t wait to see the book. Maybe I could even share a follow up page or two here. Thanks for chiming in! (Oh, and check out your photo included with today’s post on Lizzy (photo from 2011 class). 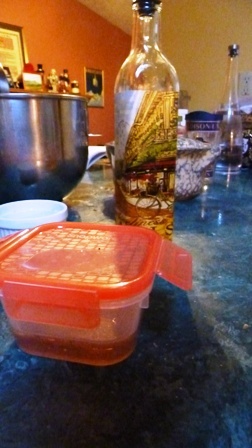 « Cooking with Lizzy, Part 2: How many 12-year-olds cook Spaetzel, gnocchi, schnitzel, piccata, tom khi gai and bolognese?